Are You Developing Character of Gold? Gold, a precious mineral, pictures well the precious character God desires to see created in you. No quest has excited human passions more than the prospect of discovering gold in some far-off place. The cry "Gold!" has driven men across deserts, mountain ranges, continents and oceans, a few to riches and fame, many more to disappointment or death. Explorers have searched the world for it. History books tell of dramatic and irreversible changes brought to entire civilizations by the discovery of gold. Spanish adventurers plundered the vast Aztec and Inca empires of Mexico and Peru, for example, seeking their golden treasures. From Genesis to Revelation the Bible speaks about gold. Christians are told to build with it, the Laodiceans to buy it. The New Jerusalem will be made of it. Gold is the first metal mentioned in Scripture, and is described as being desirable to men from the earliest times (Gen. 2:11-12). Abraham's great wealth was measured in part by his holdings of gold. Abraham's servant rewarded Rebekah with gold jewelry when sent by his master to find a suitable wife for Isaac (Gen. 13:2, 24:22). God also enjoys the beauty of gold. The New Jerusalem will be made of pure gold and have streets of gold (Rev. 21:18, 21). God told Moses to make many of the sacred objects of Tabernacle service of pure gold, and to overlay others with it. The candlestick or the Menorah, according to tradition, weighed at least 66 pounds of pure gold (Ex. 25:31-40). David amassed an amazing 100,000 talents (6.6 million pounds) of gold to be used in the Temple built by Solomon. The value of this stockpile, more than $40 billion in today's money, challenges our imaginations (I Chron. 22:11-14). 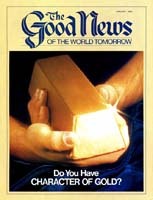 "All well and good," you might say, "but how do scriptures speaking about gold apply to me?" Here is the connection: God pictures the Christian character we are to build as spiritual gold. Paul speaks about building our faith in I Corinthians 3. Jesus Christ is our foundation (verse 11) and we as Christians are to build character upon this foundation. Just as there are different building materials of widely varying quality and value available to a home builder, a Christian is represented as having different materials available to use in building character. Three of these are valuable and will last; three are ordinary and readily destroyed by burning. "Now if anyone builds on this foundation with gold, silver, precious stones, wood, hay, straw, each one's work will become manifest; for the Day will declare it, because it will be revealed by fire; and the fire will test each one's work, of what sort it is" (I Cor. 3:12-13). The trials and tribulations of our physical lives are likened to fire that will test the character each of us is building. If we are building with the enduring materials — gold, silver and precious stones — we shall receive a reward (verse 14). Any Christian who is lax and builds character that is easily shaken or destroyed by even small trials and tests is compared to one who builds a house with perishable materials destroyed in fire. A Christian of high character and faith is more valuable to God than the best gold purified by the refiner (I Pet. 1:7). We must not lose sight that God is building within His Church today His Family to share eternity with. To Christians who were self-satisfied and complacent with their own spiritual works, God instructed, "I counsel you to buy from Me gold refined in the fire, that you may be rich" (Rev. 3:18). Let's consider the properties and qualities that make gold so desirable, to learn what they represent for a Christian striving to gain character of spiritual gold. Gold's soft, yellow luster and glow make gold objects attractive. Gold bracelets, necklaces, rings and earrings capture our visual attention with an appeal far above that of other metals. There is nothing quite so beautiful and desirable, it seems, as jewelry and art fashioned from high-quality gold by a skilled craftsman. Likewise, a Christian with the character of spiritual gold stands out from others. A deeply converted, growing Christian has a special quality of spirit nothing else can match — the inner glow of God's Spirit radiating God's character and works always. Galatians 5:22-23 details nine special attributes of such a person: "love, joy, peace, longsuffering, kindness, goodness, faithfulness, gentleness, self-control." The more these fruits of God's Spirit abound in our lives, the more golden our character becomes in God's sight. And make no mistake: This beauty of character will make it obvious to others, too, that something special sets such a Christian apart. We should not be like the builder who is content to use perishable materials just to get by, thinking that our goal is only to "make it" into God's Kingdom. Each Christian must labor hard and long to develop the very nature and character of God character of pure gold. A lot of hard work and expense goes into extracting gold from the ground, and there is not a lot of gold in the world today. One estimate says that if all the gold ever mined could be brought into one place, it would fill a cube only 18 yards on each side. Very likely more gold has already been mined from the earth than remains in ever more remote and difficult places to reach. During the California gold rush of the 19th century, miners toiled to collect an average of one-half an ounce of gold per day of work. It was hardly a get-rich-quick venture for the typical 49er! As supplies of gold left in the ground dwindle, the effort and cost to acquire the gold increases. In some of the world's mining operations today, 20 tons of ore must be processed to yield one ounce of pure gold. In some South African mines, such ore is only found more than two miles below the earth's surface. Both gold mining and building Christian character take a lot of work to succeed. We are instructed: "Therefore, my beloved, as you have always obeyed, not as in my presence only, but now much more in my absence, work out your own salvation with fear and trembling" (Phil. 2:12). God builds His character in Christians just as He created the gold to be mined from the earth. It requires effort to acquire both. It is not enough to want godly character. You must be willing to work for it with all your being. Paul writes of the effort required: "Brethren, I do not count myself to have apprehended; but one thing I do, forgetting those things which are behind and reaching forward to those things which are ahead, I press toward the goal for the prize of the upward call of God in Christ Jesus" (Phil. 3:13-14). Golden art objects buried thousands of years ago still have their original luster and beauty when unearthed by the modern archaeologist or treasure hunter. Only a few strong acids can spoil the lasting beauty of pure gold. Under normal conditions it will not tarnish or rust. Gold's incorruptible nature pictures Christian character at its best. We are not to be led into sin by the trials and cares of life, or by any of the character-destroying temptations everywhere present in Satan's evil world. God has called us to remain Christians He can count on to be faithful and obedient to Him always, no matter what corrosive influences are at work to eat away the purity of God's character in us. Paul emphasized this aspect of golden character when he wrote, "Therefore, my beloved brethren, be steadfast, immovable, always abounding in the work of the Lord, knowing that your labor is not in vain in the Lord" (I Cor. 15:58). Gold makes surfaces highly reflective; this is another of its valuable assets. Thin gold leaf has been placed on the outer surfaces of many American spacecraft to reflect the intense heat radiation encountered in outer space. Without this protection, the interior temperature of a craft would rise dramatically and endanger its contents. Gold is added to some window glass to reflect the sun's heat-producing infrared energy. In this way gold lowers air-conditioning requirements without significantly reducing the transmission of light through the window. As Christians we should give back to God and our fellowman the same love, concern and care God has given us. Our goal is to become like Jesus Christ, who in all ways and at all times mirrored to the world God's very nature and ways. He said, "He who has seen Me has seen the Father" (John 14:9). We are to shine as lights by the power of the Holy Spirit, setting a clear example to this darkened world of God's way of life. Pure gold is extremely soft, malleable and ductile. A pound of pure gold can be drawn into wire so thin it would stretch 900 miles, or it can be beaten into sheets only three millionths of an inch thick. It would require 3,000 such sheets to equal the thickness of a single 3" x 5" card. They are so thin the slightest breeze blows them away, and light shines through the gold. Gold easily alloys with other metals used to impart greater hardness or other specific properties. It is a joy for the skilled goldsmith to use. It is not brittle like pottery or glass, or hard and unmanageable like iron. Gold can be fashioned as the craftsman desires. God is our master craftsman. We are to become spiritual gold, yielded, humble, receptive to His correction and instruction without resisting or breaking. We are to be molded in God's character for His purpose to be fulfilled in our lives (Rom. 6:13). Jesus Christ set such an example for us to follow: "For I have come down from heaven, not to do My own will, but the will of Him who sent Me" (John 6:38). Gold is often used in sophisticated industrial applications where a corrosion-resistant and highly reliable electrical conductor is required. Where no chances of failure can be taken, the choice is gold. Christians, too, are to be failsafe conductors of God's Holy Spirit. God's Spirit is to flow from God through us to do the work He has in mind. We are told, "For it is God who work in you both to will and to do for His good pleasure" (Phil. 2:13). Here is a fascinating characteristic of gold: Heat causes gold compounds to break down, yielding the bright yellow metal we are familiar with. Not only does heat remove impurities from the metal by forming slag that can be skimmed off the top, but it also changes the chemical composition of gold compounds and returns gold to its pure, metallic state. God also intends the heat of our trials and tests to bring out the best in our Christian character. Gold tried in the fire is pure and refined. When we experience personal trials, we should remember that God is refining us to bring out the best, the gold of His character in us. There is a counterfeit gold, you know. It's called fool's gold, but in reality it's iron pyrite. To the unknowing it looks like genuine gold, but it is only crystals of a common iron ore.
Our lives are a potential gold mine to yield rich treasure. God gives us all an opportunity to become spiritual billionaires — we can if we are only willing to yield to Him and overcome. If you don't know the real thing, iron pyrite can fool you. I remember when I was shown fool's gold by a neighbor boy. We were 6 or 7 years old, and my eyes grew big and I became excited to see a big crystal of pure gold. But I was only being fooled. The lesson here is to be careful. Be sure that the character you are developing is really God's gold and not your own counterfeit. Put it to the test. Old miners would put the ore they discovered to a simple test. They would bite it! If it were really gold, the soft, precious metal would yield to their teeth and dent. This was gold. If the ore were really pyrite instead, a hearty bite might break a tooth! The Ten Commandments, Jesus' Sermon on the Mount and the list of the fruits of God's Spirit (Gal. 5:22-23) are only a few of the many tests we can use to examine our character, to see whether or not it is in full harmony with God's Word or just some worthless substitute — our own counterfeit righteousness. It is not too likely that any of us have a real gold mine under our house or in the backyard. No alchemist ever succeeded in converting base metals to gold, and it's highly improbable that any of us will strike it rich by discovering a treasure of the bright yellow metal anywhere. But don't despair of riches. Our lives and experiences are a potential gold mine to yield rich treasure. God gives us all an opportunity to become spiritual billionaires if we are only willing to yield to Him, overcome and put forth some plain, hard work, using the tools of prayer, Bible study, fasting and meditation to extract spiritual gold from the experiences of life. This gold is even more valuable than the metal, which can be lost, stolen or destroyed. The time is coming when men will realize there is no lasting benefit from seeking security and protection from money and precious metals. God alone is our sure provider (Ezek. 7:19). Remember the lesson of the Laodiceans. They were self-satisfied and did not look to God for their needs and security. They were content with their own character and righteousness. They did not know the danger of spiritual fool's gold (Rev. 3:14-17). God told them to come to Him "to buy from Me gold refined in the fire," so they could come to possess the true gold of God's righteous character that alone will endure eternally (verse 18). The opportunity to gain the spiritual wealth God offers to those He has called is there for all who are willing to put forth the effort to develop God's character. The reward God promises is to become part of God's special treasures, part of His spiritual Temple (Mal. 3:16-17). The gold is there, waiting. The cry "Gold!" has echoed for more than half a century now through the ministry of Herbert W. Armstrong and the Worldwide Church of God. It's up to you now. Go and get it!